Why drink from a horn from THE HORN STORE? There are many internet retailers that offer imported horns coming out of India. These 'India' horns are deceptively called 'drinking horns', but are nothing more that plain old horns - Poorly cut and polished, with no lining inside whatsoever. The purveyors of these horns even tell you how to deal with the odor they produce - YUCK! Here at THE HORN STORE, All our drinking horns are coated on the inside with a hard plastic lining that is suitable for hot, cold, and alcoholic beverages. It has no odor, and will not effect the taste of your drink. Not only are they sanitary to drink from, but the lining will last the life of the horn, and never needs to be re-treated. Your drinking horn from THE HORN STORE will last for generations. We make them in our family-owned shop in Colorado, and take pride in the workmanship that goes into each and every horn. What are your drinking horns made from? 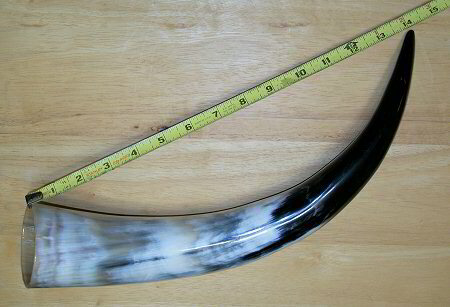 All our drinking horns are made from authentic cattle horns - obtained from animals used for food. They have been sanded and polished on the outside to bring out their natural color and lustre. We make all of our drinking horns in our family-run shop in Colorado, USA. We believe in the quality of American made goods, and are proud to boast, "Made In The USA". How do I know what my new horn will look like? Your new horn will be the exact horn shown on our listings. We photograph and measure each horn individually so you know exactly what you will receive. What is on the inside of the horns? The raw horns initially contain a bony material which has been removed. The interior of the horn is thoroughly cleaned, and then coated on the inside with a clear, safe, plastic coating. Can I drink hot coffee from them? What about cold or alcoholic drinks? The inner plastic coating will withstand the hottest beverages without affecting the taste of your drink. Our drinking horns work equally well for all cold and alcoholic beverages. Our drinking horns are very durable, and easy to care for. Each horn is shipped with a simple use-and-care guide to ensure your horn is always at it's best. No... Of course not. Drinking horns that leak would not be very popular. Each drinking horn comes with a sturdy leather strap. They can be hung from the shoulder, and will stay upright - even with your drink inside. When you're not drinking from them, they can be worn across your body to keep them tight and secure. 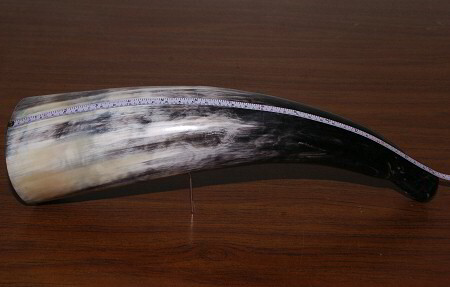 How are drinking horns measured? We measure the length of our drinking horns from the rim of the mouth directly to the tip. We believe this gives our customer the best idea of how a horn will fit when hung from the shoulder. We measure our drinking horns straight across from lip to tip. In the example above, this drinking horn measures 14 inches. A drinking horn worn over the shoulder. This horn measures 18 inches long. The capacity of each horn is measured by filling the horn completely to the brim. Keep this in mind when choosing your horn. You will want to order a horn that's two or three ounces larger than the size of your intended drink. For example, order a 14 to 15 ounce horn if you wish to use it with a 12 ounce drink. How are blowing horns measured? Blowing horns are measured differently. We determine the length of our blowing horns by measuring the distance along the back side of the curve. This measurement ensures that horns of the same length will have a similar sound regardless of their shape. Blowing horns are measured around the back side of the curve. In the example above, this blowing horn measures 14 inches. How do you set them down? Do you make stands for them? Our drinking horns are designed to "hang up", rather that being "set down". However, we will be offering tabletop horn stands and horn + stand combinations in the future. 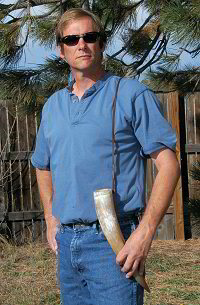 drinking horn holsters are also available for wearing your horn on your belt. A customer of ours had a unique solution for setting horns down. We supplied him with a large number of horns for his tavern, and he cut holes in the bartop for his patrons to set their horns in. You will receive the exact horn pictured that you add to your shopping cart . We photograph and measure every horn we sell, so you can choose the perfect shape, color, and size of horn to suit your needs. Why is each horn limited to a quantity of one? Since every horn is an individual and unique piece, only one of it exists in the world. They are unique as fingerprints, and no two are exactly alike. “Unworthy” is the term we use for horns that are not up to our highest quality standards. You can think of them as seconds, blemished, or irregulars. All of our “unworthy” horns are still fully functional, and coated on the inside. Some of the conditions which cause a horn to be labelled “unworthy” are: rough areas on the finish, open external blisters, or unusual shaped mouths. None of these conditions affect the usability of the horn. “Unworthy” horns are sold at a discounted price, but are not always available. Yes, we can do special orders. Please phone or email us your requirements, and we'll get back to you. Yes, we always support our military men & women. Please note however that the tracking number received will only show delivery status to the military postal service center. We have no control over how long it will take from there. YES! We welcome orders from international customers. 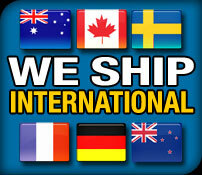 We are experts at shipping overseas. How much is international shipping on my order? Shipping charges for orders sent outside the USA can be reviewed on the order checkout page after you enter your shipping details. You are not required to complete your order if the shipping rates are not to your liking. Most orders are shipped within one or two business days. If you must have your order delivered by a specific day, please contact us before placing your order to ensure we can meet your deadline. Items damaged in shipment should be brought to the attention of the shipping carrier as soon as received.